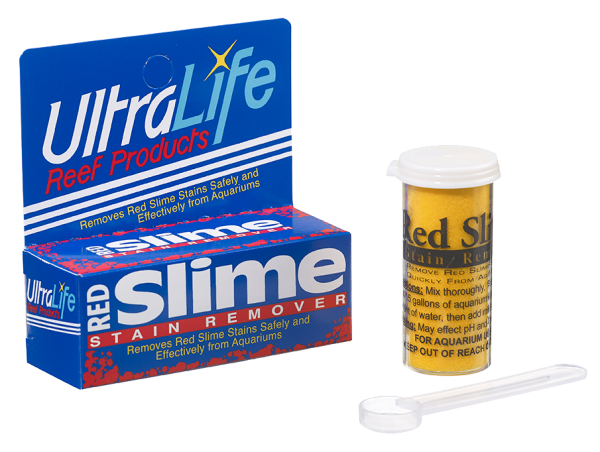 Ultralife Red Slime Stain Remover is a revolutionary new product designed to solve the problem of Red Slime stains in your aquarium, and it does it effectively and safely while remaining very user-friendly. The Red slime stains that appear over time in saltwater aquariums are a challenge to deal with, not only does it ruin the look of the tank, but it can be harmful if allowed to build up too far. It has always been a problem to clean out, but now there is a solution. Ultralife Red Slime Stain Remover has been specially formulated to deal with this problem specifically, using a secret mix of natural ingredients, supplements and biological accelerators to provide the ultimate red slime stain remover. It’s easy to use, simply mix a small amount of aquarium water with the appropriate amount of product using the included measuring spoon according to your aquarium size, and then simply add it straight into your aquarium water. There is no need to change the water or filtration system, making this a simple solution that can be done in minutes. It is completely safe for all aquariums and available in several sizes to keep your aquarium slime stain free. The safe formula is harmless to fish, Corals, macro-algae, and nitrifying bacteria. Ensuring that your carefully maintained aquarium environment is undisturbed for maximum effectiveness. UltraLife RSSR will accelerate the solubilization and biological digestion of organic solids. In the process, the oxygen uptake rate in your aquarium will increase as a result of this increased biological activity. It is very important that your aquarium is able to support this increased oxygen demand along with your aquatic life`s need for oxygen. Therefore we recommend increasing your O2 levels by the addition of airstones prior to and during treatment.